My grandmother Edith used to buy a set of salt & pepper shakers in every place she traveled. It was an eclectic collection, with some sets reflecting the specific place (like Mexican sombreros) and others not (like the set shaped like two stalks of celery). Her children and grandchildren also started sending her sets from where they traveled. The shelves where Grandma displayed the salt & pepper sets were right at eye-level for us grandkids, and I would always peruse the shelf for new ones, asking where they came from, who brought them. I would pick them up, turn them over, and examine them with interest thinking about the place from where they came. I think many of us want to bring back something specific from the places we visit that reminds us of our travel, something that reflects the particulars of a place. We want to find gifts for our loved ones that can’t be found anywhere else. And doesn’t everyone still have that excited thought (leftover from being a kid) when a family member comes home, “What did you bring me? What did you bring me? !” And it’s not the latest from Target that we’re hoping for; we’re hoping for something we can’t find here, at home. Travel is supposed to give us a break from monotony and routine, including the clothing, objects and foods we bring back. But finding something specific to a place has become harder to do. While there are always local food items – spice mixes, a fancy olive oil, rhubarb wine – with airline restrictions, even that is getting harder. Clothing is also difficult. 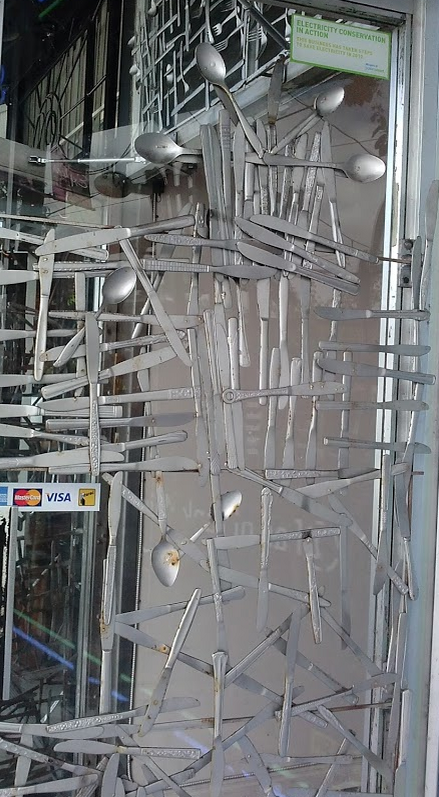 Stores in Amsterdam, Copenhagen, Los Angeles, Chicago and New York have pretty much the same items as they do in Twin Cities. An H & M in Paris might have slightly different shirts than one in Minneapolis, but really, who cares? And even if I buy an I Love NY T-shirt, it’s still likely to actually be made in Bangladesh or India. This state of affairs is not new – I remember when I studied abroad in the late 1980s I was surprised to find Benetton, Esprit and look-alike department stores in every major European city. It was then that I discovered that shopping secondhand is key to finding local or at least unique items while traveling. I first discovered this at the Waterlooplein Market in Amsterdam. I came home with aging Dutch lace curtains like the ones I saw in nearly every window, a short olive-colored Dutch army jacket and a crisp white cotton lace-trimmed nightgown, which I intended to belt and wear as a dress. The secondhand markets have been a something I look forward to on every trip. And the vintage stores. I’ve learned that looking up city streets and neighborhoods where vintage shops cluster is key to discovering the part of town where more local, unique shops in general can be found. There’s a reason. When geographers Nicky Gregson and Louise Crewe studied where vintage and secondhand shops cluster (for the book Second-Hand Cultures), they found that retro shops are found in urban neighborhoods with more edge than the “high streets” occupied by franchised stores. This occurs because such areas have lower rents. Vintage stores clustering with businesses that attract a similar crowd do best; thus the tendency for vintage shops to be located on streets with coffee shops, tattoo parlors, funky breakfast-all-day diners, t-shirt screen printing shops, and local designers trying to make a go of bricks-and-mortar retail. 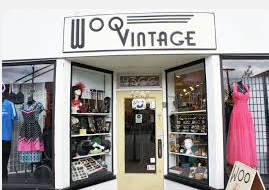 I was recently in Vancouver, British Columbia and looked up where the vintage shops cluster. 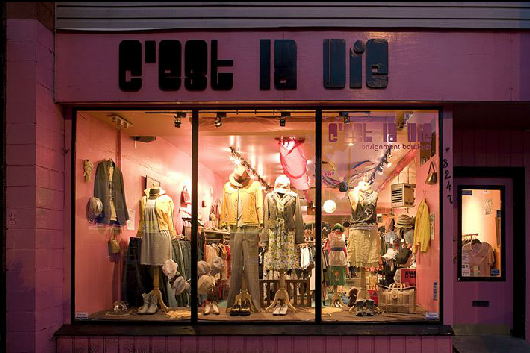 Sure enough, Main Street not only produced a fun vintage store tour of Vancouver (C’est La Vie Vintage, Woo Vintage, F as in Frank), but also shops that sold the work of local Vancouver designers (Twigg & Hottie Boutique, Two of Hearts Boutique, Devil May Wear or Motherland). I actually came home with some cool things that contain a “Made in Canada” label. Making vintage stores a must-do for travel has also helped me see overall “trends” in vintage. While not as homogenous as H & Ms, there can also be a certain sameness to vintage shops. For example, it seems like the majority of vintage clothing stock is polyester. I think of this as an evolutionary process – a sort of “survival of the fittest” in used clothing, the Triumph of Polyester – because it, like other plastics, lasts forever. 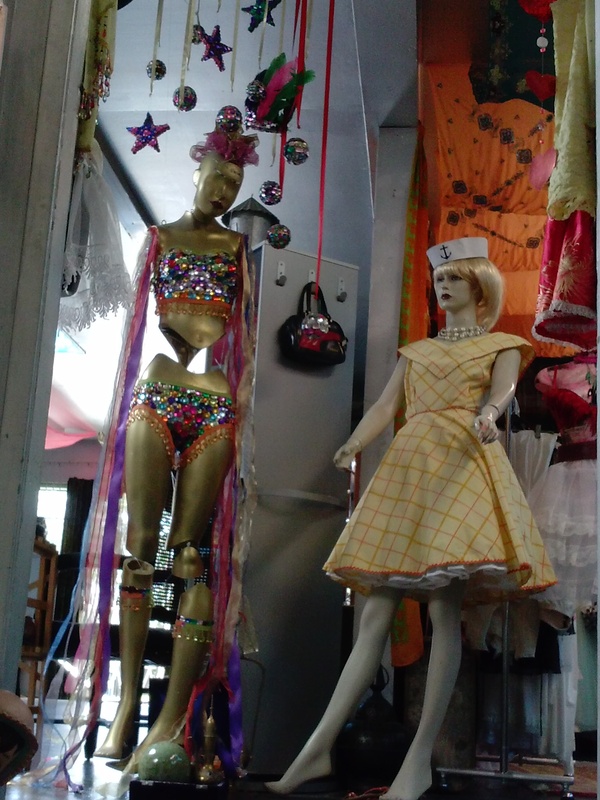 Vintage stores almost always have a certain whimsy, carnivalesque quality to them – mannequins dressed in wild hats, garish patterns, bright colors. And there’s usually a certain messiness – a sense that one has to hunt a little to make the great find (in fact, Gregson & Crewe found that making customers forage a bit was often key to making customers feel like they’ve found a bargain). And of course, I observe regional variations in vintage stores. For example, forget trying to find nice vintage sweaters in cold-climate stores – people here won’t give up a good sweater, even in the afterlife. Los Angeles vintage stores are impeccable – only perfect-as-a-Hollywood-costumes are on the racks. Places where it rains a lot (Portland, Seattle, Vancouver) have more leather coats in stock. After years of making vintage shopping a much-anticipated part of my travel experiences, I’ve got a closet full of clothes that remind me not just of other times (distant from my own life), but of places and trips that have had meaning for me.